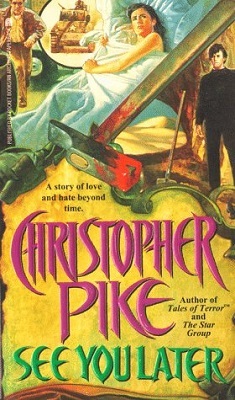 I had never heard of Christopher Pike, so didn’t know what to expect when I opened up See You Later and began to read. After only a few paragraphs I was impressed by the quality of the writing and gained an immediate liking for the central character—eighteen-year-old Mark Forum. See You Later is written in the first person, so the reader receives the full story as seen through Mark’s eyes and told in his own words. This can be quite amusing. He is an entertaining chap. Mark makes his living by writing computer games. He isn’t rich by any means and, although he tends to be very modest about his abilities, Mark has a lot of talent and plenty of self-confidence. Except with girls. He never knows what to say when he meets a pretty girl and this is the problem he has when he first encounters Becky. Becky works in a record store and as soon as Mark sees her he is attracted to her. Fortunately for Mark, Becky breaks the ice. She says, “Hi.” And Mark replies: “What?” It’s not the best of starts, but once Mark starts talking he does better than he realizes and Becky is more than a little impressed when she finds out what Mark does for a living. Mark begins visiting the shop often and he and Becky soon become friends. Unfortunately, when Mark eventually plucks up the courage to ask Becky out he discovers she already has a boyfriend and isn’t interested in anything other than friendship. Mark continues to frequent the record shop and it’s there that he first meets Vincent, and is instantly drawn to him. Vincent is very self-assured and has an easy manner. Mark thinks Vincent looks familiar, but if he has seen him before he can’t remember where. Vincent tells mark that he also writes computer games and asks him if he would take a look at his latest project. He is stuck and could use some advice. Later that same day Mark meets Vincent’s girlfriend, Kara. Like Vincent, Kara has blond hair and blue eyes, but whereas Vincent is calm and serene, Kara is full of vitality. By the time Mark goes home he has made two new friends and settled into the friendship quickly and easily. When the subject of Becky comes up in conversation Kara is immediately obsessed with the idea that Mark and Becky belong together and she comes up with an elaborate plan to clear the way for Mark by causing Becky and her boyfriend to split up. Although Mark is not keen on the idea at first, he goes along with it and—thanks to Kara—Becky becomes available and she and Mark go out on a date. Then a strange man appears on the scene and things start to get weird. Mark needs answers and Kara is the only one who can provide them, but what a strange story it is that she has to tell. My copy of See You Later was 176 pages long and I read it in one sitting because I got so curious about what was going on that I couldn’t wait to find out the answers. See You Later is a hard story to categorize though, and could easily be tagged as belonging to more than one genre. There is horror in the story, but there are also elements of sci-fi and mystery—there is plenty of mystery. Then there is also the love interest, not only between Mark and Becky but between Vincent and Kara. See You Later is not a very long novel, but there is a lot happening throughout the book—more than at first appears—and it is also a story that makes you think. So when I had finished reading the book that is what I did: sat and had a think. I can’t tell you what I thought about because that would spoil the book for you if you decide to read it yourself. See You Later is a little sad at the end—I thought so anyway—but it is a very good story and I will definitely be reading more of this author’s work. If you are not familiar with Christopher Pike’s fiction, See You Later is a very good place to start.